Catalog Page 50. 8” Benny Bears with personalized t-shirt. Custom stuffed brown and black bears. Catalog Page 50. 8” Benny Bears with personalized t-shirt. Custom stuffed brown and black bears. 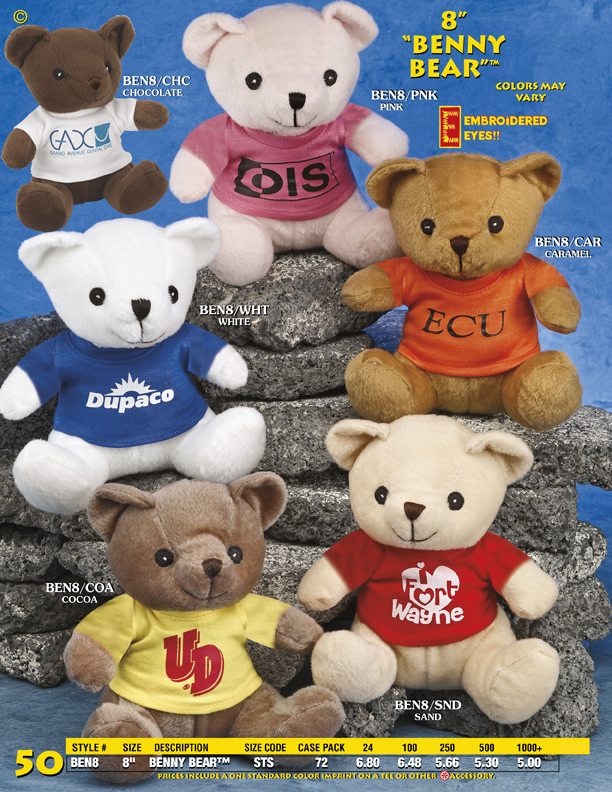 8" Benny Bears with custom printed shirt featuring your logo or custom text. The 8" Benny Bears are available in brown, blue, pink, black and white color. You can mix the animal colors or shirt colors as needed. The lead-time for production is 10 - 14 days. The Benny Bears are an affordable solution for ordering personalized teddy bears at a low price. Each bear is 8" in height when measured from the bottom of the feet to the top of the skull. The eyes are embroidered for additional safety when distributing the teddy bears to children.